It has been 60 years since Central City Opera premiered the Douglas Moore opera, “The Ballad of Baby Doe.” When I learned they would produce this work I wanted very much to see it. Back about 12 years ago I participated in a production of this wonderful opera when I was with Opera Illinois. I was both the chorusmaster and a chorister on stage and also served as assistant conductor. I came to really love this opera. 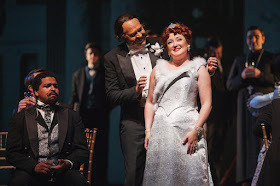 As it happened in addition Central City was also doing a production of Puccini’s great opera “Tosca.” So I arrived in Central City on Tuesday ready to see both operas. 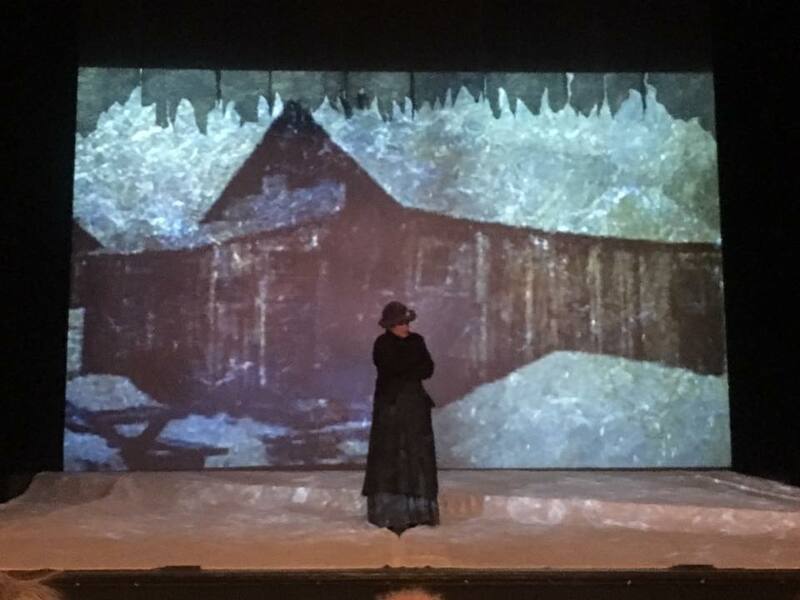 Tosca first – This opera could be called a “warhorse.” It is produced often and I have seen it more times than I can remember, I have also prepared the chorus and performed in it as well (I got to be the captain of the firing squad – pretty cool!) I have seen productions of this opera at the Met, at LOC, at Opera Delaware and on and on. And I have to say that of all the times I have seen this opera I cannot remember ever experiencing a better acted performance. These singers were not only terrific singers, but really great actors. I was completely absorbed by their performance. Alexandra Loutsian was a wonderful Tosca with all kinds of character nuances. From her jealous outbursts to her simple and naïve religious convictions to her devotion to Cavaradosi to her terror of Scarpia - it was all here. And when she finally gets up the nerve to stab Scarpia to death at the end of act 2 her sobbing was so visceral and realistic I wondered if she was going to be able to sing the remainder of the act (she did, BTW). Her performance of the great famous aria Vissi d’arte was incredibly moving. Here was a woman whose faith had been destroyed and she was left with nothing but her own inner strength. And then there was Michael Mayes as one of the most subtle but cruel Scarpia’s I have seen. 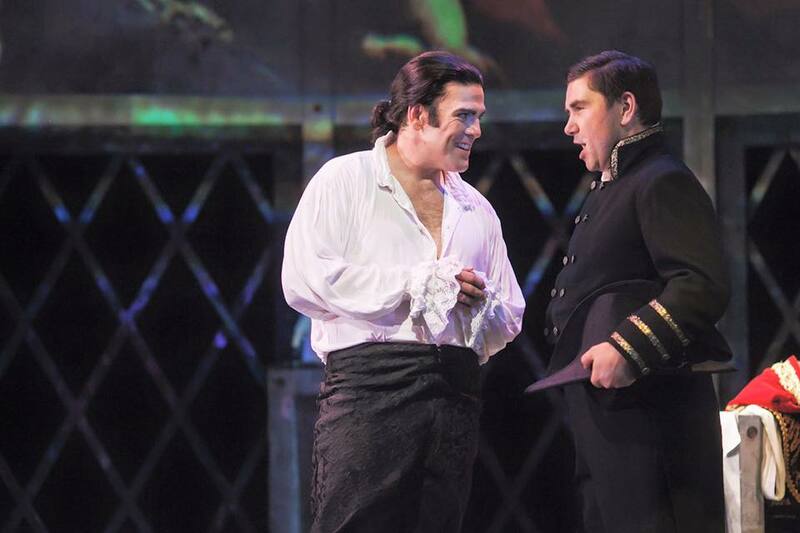 From his initial appearance he dominated the stage, and he continued to dominate the opera even into act 3. His Va, Tosca was terrifying in its obsession. And in act 2 he was able to cajole, to be gentle, to be cruel and ultimately to be lustful and violent. Mayes created an incredible arc for this character and in the process gave us a truly remarkable and memorable performance. I believe this run may have been his role debut, but I cannot believe that he will not have many, many more Scarpia’s in his future career. This was not a cookie-cutter evil Scarpia – Mayes gave us a nuanced character whose lust for power both ran deep and at the same time controlled him. Finally there was Jonathan Burton’s Cavaradosi. 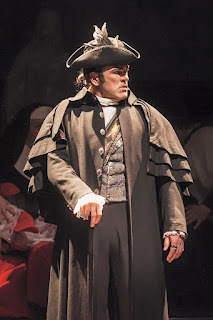 Perhaps this character is the only character in the opera who one might say is at all “normal.” He is creative, works for a living, has a famous lover to whom he is devoted, but still is patient and indulgent of Tosca's silly jealous fits and he takes a huge and ultimately tragic risk in agreeing to help the political escapee Angelotti. At the same time he is courageous and is the only character who dares to stand up to Scarpia – this is what gets him killed in the end. Well, that and the inconvenient fact that he is the boyfriend of Tosca. Burton had all of the light, loving gentleness that the role requires. But was also able to convey the courage and determination as well. His Vittoria was simply glorious. And his E lucenvan le stelle was heartbreakingly gorgeous and yet his O dolci mani was so incredibly tender and loving. I particularly appreciated his reaction to the news that he would be shot. Like Domingo it was obvious he knew exactly what would happen and he conveyed that to the audience, but yet allowed Tosca to continue with the fantasy that they would be able to get away from this horror together. These three leads were simply terrific! And the supporting cast were also excellent. I especially liked Peter Lake’s Spoletta. I do not like it when the director gives the Spoletta and the Sciarone as conscience. Power corrupts and tends to seduce. We have seen it in our own times not to mention the historical reality. Those who are called upon to do the dirty work of violence and cruelty do so often with no sense of remorse or conscience. Such I believe to be the case of the Sbirri Spoletta and Scarpia’s orderly Sciarone. One of the oddest moments in the opera occurs during the torture scene in act 2. Tosca is reacting to the torture of her lover and pleading with Scarpia to stop it and trying not to let on she knows what Scarpia is trying to find out – something she does not do well. At one point just before she breaks and gives up the info, she is pleading and Spoletta sings behind her pleading a chant in Latin – it is a prayer of some sort. It is rather odd, and it is always interesting to me to see how this is portrayed. Too often the Spoletta is having a moment of pity and says this prayer as a way of repenting, or expressing sympathy for Tosca. That I think is completely the wrong way to approach it. In the Central City production Spoletta came up behind her and spread his arms and the chant became a kind of cruel mockery of her faith and situation. I thought it was just right as it set up the aria which follows in a bit where Tosca herself questions her faith. Among the other supporting cast Donald Hartmann did a fine job as the nervous Sacristan, though he may have been a little bit over the top at times. 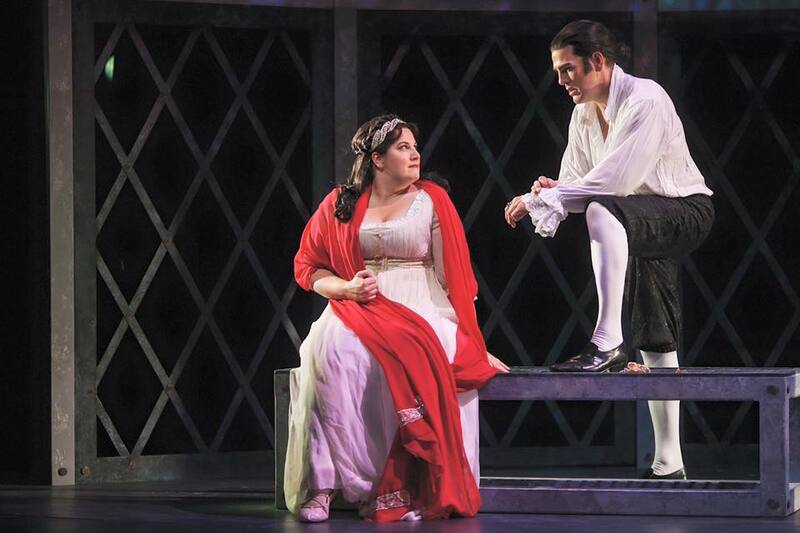 And Stephen Clark was an excellent Angelotti, though the wig just didn’t work. Minor points. I was also surprised that women were added to the children’s chorus. Having trained the children’s chorus for this opera I was a little disappointed to hear women’s voices dominating the scene with the children’s chorus as I particularly love the sound of the children’s voices. But the scene itself was effectively staged. I was also disappointed that the Shepherd was sung by an adult soprano instead of a boy. She did a lovely job, but… well… the boy’s voice is just different. But the staging of that scene with the projections of the sheep was pretty fun. This brings me to the staging by Joachim Schamberger. In the first sentence of his director’s notes he states that he sees Tosca as a “poignant metaphor” for the quest of freedom. Later he describes how the set is designed to be “cage-like” trapping humanity – us all – into cycles of violence and suffering from which we cannot escape. And so the concept of reality was flipped: the true reality was being locked in a cage from which escape is impossible and the settings – the church, Scarpia’s apartment to parapet - all of that is fantasy. This was conveyed by the very ingenious use of projections that allowed us to see into the minds of the characters. And the modern dressed extras at the beginning (before the music) and at the very end brought us, the audience, into the cage. We are trapped just like the characters in this story of Tosca. This is a profound and powerful concept and one that I think has great potential and I hope that the director will have a chance in the future to refine it in future productions. The major problem was that without having read the director’s notes or attended the preview there was no way one could pick up on any of this. This is in large part because the set itself didn’t look much like a cage but rather looked like a set of doors. The set needs to be reworked for the future I think to make it more obviously cage-like. But I love the concept. After I figured it out it has dominated my thoughts – and this is also because the cast were all such great actors. One last little detail that I didn’t quite get – there was some kind of odd relationship between Scarpia and Roberti. I didn’t get the elderly disabled take on Roberti, who then refuses to receive any money for doing his job? Was he some kind of true believer torturer? And there was an odd and creepy affection between him and Scarpia as well. What was up with that? And why was the Judge then not drawn in a more detailed way to match the Roberti? But on the whole, I loved this performance. Finally I will mention that the orchestra was great and the conductor John Baril excellent. His pacing and his ability to maintain coordination with the stage was almost uncanny. 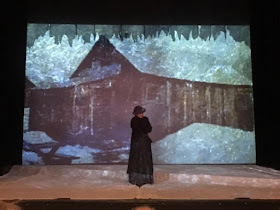 The Ballad of Baby Doe – As I stated above I love this opera. It holds a special place in my heart. The staging of this opera was also not necessarily completely traditional. Gone were the realistic sets and the sense that we are watching the story unfold in real time. Instead the first image is of the miner’s shack at the Matchless Mine where Baby Doe Tabor eventually froze to death and an elderly Baby Doe wandered the stage and we entered into her reflections and memories. Projections continued to bring us into the story – the original hotel lobby among other scenes. Frayed drapes represented frayed memories upon which images of Horace and Baby Doe and Augusta were projected. We experienced the story unfold as Baby Doe herself remembered her experiences and her life. It was ingenious and it worked beautifully. I loved this production and felt it was outstanding. Hats off to director Ken Cazan. Again the principals were not only terrific singers but excellent actors, each and every one of the completely embodied their characters. First among equals though was Suzanne Mentzer as Augusta Tabor. Her performance was simply brilliant. Her acting and her singing were amazing. 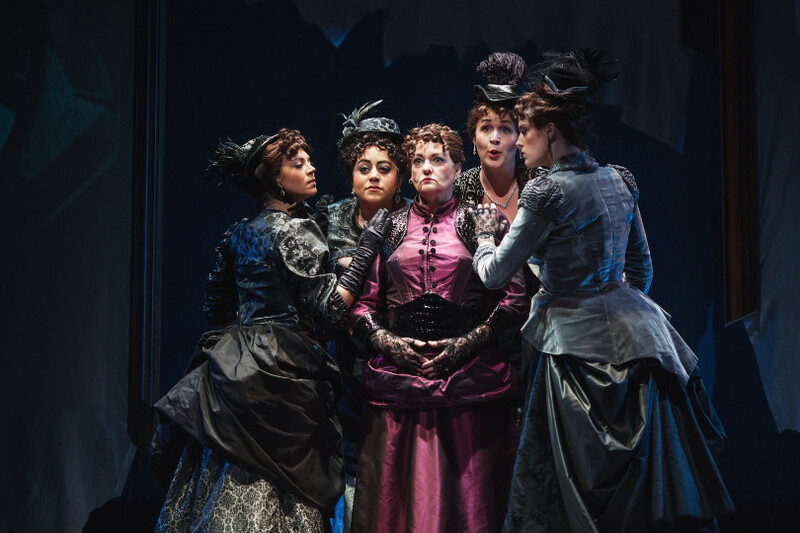 My favorite scene in the opera has always been the scene with Augusta and her 4 friends – What do you intend to do Augusta? – (see the photo below) at the end of this scene Augusta declares that if Horace attempts to divorce her he will “rue the day he was every born.” Beginning on a high a on the word “rue” the musical line descends to the lowest note in the opera for her on the word “born.” Stunning! Mentzer’s performance of this entire scene was chilling. You do not want to mess this with woman! I also loved her act 2, when she begins to take responsibility for the mistakes she made, and her attempts to try to reach out and then her incredible final monologue. I don’t know how to describe it except to say that Mentzer was simply brilliant. Hers was a powerful and moving performance. This is not to say that she was not matched by her co-stars. I loved Grant Youngblood as Horace. He was vocally strong but he also embodied Horace’s dependence and flamboyance and his complete inability to manage his life. And I was totally convinced of his commitment to the silver standard which will be his undoing. Even as everyone else (including Baby Doe) try to get him to see the writing on the wall he stubbornly holds onto this out of principal, but a principal that destroys him. His final scene – the memory scene where he relives parts of his life – was a tour de force. He was completely broken and he conveyed this. As his love Baby Doe, Anne Christy also did a beautiful job developing the character arc for a young woman who is kind of on the make to a woman who truly and sincerely is in love and supports Horace no matter what. She also did a wonderful job with the devilishly difficult vocal writing. My favorite of her arias is in the wedding scene – Gold is a fine thing – her hymn to silver. This was beautifully sung. And in the rally scene for William Jennings Bryant she was dutifully loyal despite the sense that this was going to end badly. Horace and Baby Doe at their wedding - Act 1 finale! I have to say that Donald Hartman was absolutely terrific as William Jennings Bryant. He may have been a little over the top as the Sacristan, but not so as Bryant. He commanded the stage, he was the experienced politician greeting everyone at the rally and each greeting was different. And his “aria” speech (actually a real speech by the historical Bryant set to music) Good People of Leadville was masterful. He built it slowly until finally the chorus could not help but erupt into cheers and celebration. He is in the one scene only – but he was great! Well Done! I can’t possibly mention all of the rest of the cast by name, this is an opera with a huge cast. But all of the supporting roles were done very well. Sarah Barber was also excellent as Baby Doe’s mother Mama McCourt. I loved how she drank so much that it loosened her tongue and she blurted out the information about the divorces, which scandalized everyone, especially poor Fr. Chappelle. Augusta’s 4 friends, and Horace’s 4 cronies also were particularly good. I mentioned the scene with the friends, but the gambling scene with the cronies was also very well done. Finally the chorus was excellent. I know that chorus part and the final chorus is gorgeous music and it is not that easy, but they did a beautiful job, I also loved the chorus in the rally scene and in the wedding. The 7/4 rhythm which dominates the scene gives a sense of everything out of balance, and sometimes can actually cause problems between the stage and the pit, but not in this performance. The chorus, principals and the orchestra were excellent and the conductor Timothy Myers was excellent. My experience with Central City Opera was really excellent. They did a great job, the hall has great acoustics, even if the seats are not so comfortable. But in closing I should mention that I found Central City itself to be a rather challenging place to visit. We were lucky to find a lovely place to stay, but finding food for meals was a task. There is one good restaurant, the Teller House, which is always booked and which has the oddest hours. So if there is no evening performance then they don’t open for dinner, despite the fact that the opera matinee gets out at 5:30 which is exactly dinner time. So what to do, well, one is forced to patronize the casinos. This I found very uncomfortable. Perhaps it is my profession, but I have seen how people’s lives are destroyed by gambling and I disapprove of gambling quite a lot since gambling tends to target those who can least afford it. (Maybe Central City Opera needs to do a production of "Queen of Spades!") But if you wanted to eat that was the only option – to wander through these horrid casinos in order to get poor food which was incompetently served. Each of the casinos had a sign that no one was allowed on the casino floor unless they were over the age of 21. Not a problem for me. But what if I had children with me to attend the opera, and I was not able to get into the Teller House? Then what? In order to get to the restaurants in the casinos one has to walk through the casinos – so I guess the children are supposed to starve since they can't get to the restaurants. It is simply absurd and this is an issue that the city and the opera should address. I would frankly not be inclined to return for this reason alone. And if I ever do, I doubt that I will stay in Central City. But from a purely operatic standpoint it was a wonderful couple days. I loved both operas and so glad I got to see them, even if finding meals was such a chore. Fantast reviews - we hold the same views on gambling - I suspect Sue and I would have starved as we did on the one ocassion we went to the opera on Monte Carlo and discovered you could only eat in the Cassino. I had never thought of Cavarodossi being the only normal person - but I think I will in future. Your review makes me want to see the ballad of baby Doe. Brilliant review, as always my dear friend. Didn't see the Tosca, but agree about Baby Doe and the dearth of eating choices. We stayed at an airbnb outside BlackHawk with a kitchen and cooked for ourselves to solve the problem.